Most of the French New Wave directors were influenced by one classic Hollywood director: Alfred Hitchcock. They worshiped at his tense thriller altar, creating books, intellectual studies and homages to his famous films. Almost every French New Wave director has a film in their filmography that could be said to have drawn off of the Hitch’s influence. One director from this elite sect of directors seemed to have created filmic sacrifices to the great god Hitchcock. That director was Claude Chabrol. Although he made other kinds of movies, almost every thriller he did was greatly influenced by this man. 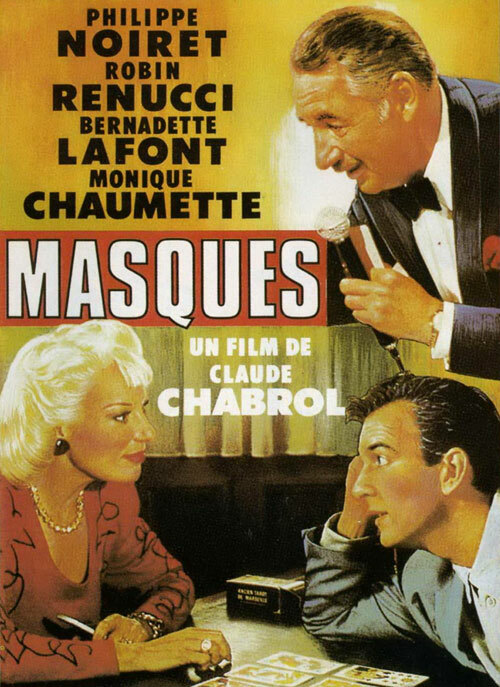 No more apparent is this but in Masques, one of his later period thriller. But did Chabrol do a better job than Hitchcock would have done in the same circumstances? I guess we shall find out. Christian Legagneur (Philippe Noiret) is a famous game show host. He hosts a show where older people show off their talents in order to win prizes. He is warm and engaging on it. And he is insanely rich. A scrappy young reporter is assigned the task to write a book about his life. Legagneur invites this young reporter, Roland Wolf, to his country estate where they can “work” in peace. Almost immediately Wolf is curious and suspicious about the goings on in this odd home. Legagneur is taking care of an invalid daughter of one his dead best friends. She happens to also be an heir to a fabulous fortune that was put into an account with both of their names on it. As Wolf starts his assigned project, it becomes apparent that Legagneur is not good at ruminating for long periods on his life. He always seems to be off doing something else. Thus he leaves Wolf alone to investigate a side project of his. You see Wolf isn’t who he says he is. He is in fact the brother of a vixen who had disappeared from the Legagneur estate a couple of months ago. Legagneur claimed that she and his invalid ward, Catherine, had a falling out and she had left to act in some provincial town, never to be heard from again. Wolf does not buy this excuse and starts to find little clues as to what his sister’s fate was. He also falls in love with Catherine only to realize that Legagneur has a strange fascination with keeping her sick. As Wolf unravels the mysteries lurking in this country estate, it becomes apparent Legagneur is not really who people think he is. This movie wears several Hitchcockian tropes on its sleeves. The reversal of character, the red herring of completing a book, a couple thrown into the proceedings but nothing more than comic relief, the forbidden and sudden romance and craftiness of the villain all scream out Hitchcock. But there was a reason that Hitchcock was such a master: he is easy to copy, hard to copy right. This movie feels like a copy of a copy put somewhere to die. The only thing that makes it bearable to watch is Philippe Noiret who puts in a complicated and nuanced performance of this game show host. Almost everything cannot escape its blandness nor the creeping feeling that I should be watching Hitchcock instead.